www.PowderBulkSolids.com 21 J u n e 2 0 1 8 Are Your Valves Compliant with NFPA? Rotor Assembly Tolerance Check We only like explosions in the form of really cool ones in Michael Bay movies we watch from the comfort and safety of our own homes. We emphasize the word safety here, because in real life, explosions can have serious consequences and precautions must be taken to prevent them. This means staying compliant with NFPA in your plant or facility. Though you can't stop explo- sions by using a rotary valve, they can help stop the spread of flames along your conveying line, should an explosion happen. That's why we've put together a video guide on how to check your rotor-to-housing tolerances to ensure that they stay below the compliant 0.0079 in. 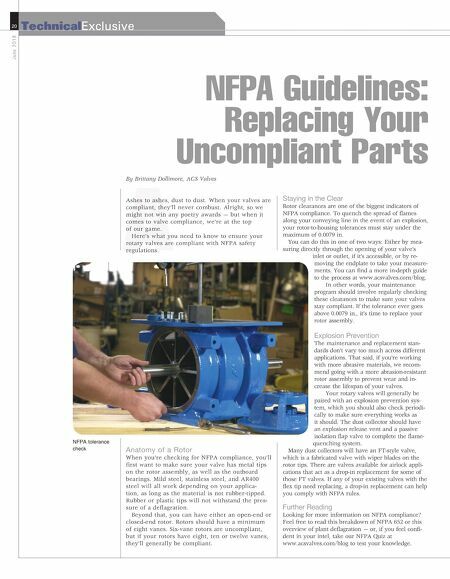 Check it out, and a summary of the steps required, below.Watch the video: http://acsvalves.com/blog/read/ title/are-your-valves-compliant- with-nfpa What Steps Should I Take? If the inlet or outlet of the valve is accessible, the clearances can be measured directly through this opening. If the inlet or outlet is not accessible, inspection is performed with the endplate removed. It's easier to do this tail side because it's not necessary to remove your drive package. 1. Loosen and remove chain drive guard 2. Loosen and remove bearing lock-collars a. Remove allen set screw from collar and peen down groove formed by set screw using a small flat punch b. Loosen collar by rotating col- lar in the same direction as the shaft rotation. Use drift pin in the through hole (not threaded set screw hole) and tap with hammer to rotate collar. c. Slide collar off shaft 3. To measure the clearance be- tween the rotor and the end- plate, attach an indicator to the end of the shaft, and set it to zero. 4. Plush the shaft towards one endplate, and the indicator will show what the clearance is. There should be a minimum of 0.0079 in. on each side of the rotary valve. 5. Next, take all the bolts out of the tail side endplate 6. Remove the endplate off the housing by using a wheel puller tool and take out your set of feeler gauges. 7. Stick the gauges between the housing and both the bot- tom and top rotor blades until you feel friction from both feeler gauges. If your tolerance is higher than 0.0079 in., it is time to replace your rotor. You can find a replacement kit here. Things to Remember to Stay Compliant • Two vanes must be in contact with the housing at all times. We recommend using a rotor with eight or more vanes. • Six-vane rotors are uncompliant with NFPA. • Rotor vanes must be 3 mm thick. • Rotor tips must be of metal con- struction. 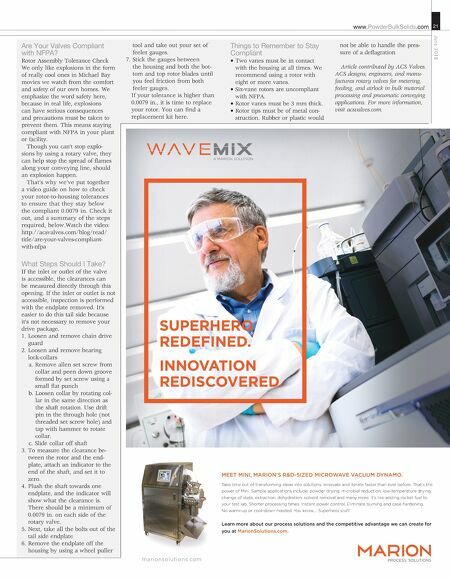 Rubber or plastic would not be able to handle the pres- sure of a deflagration Article contributed by ACS Valves. ACS designs, engineers, and manu- factures rotary valves for metering, feeding, and airlock in bulk material processing and pneumatic conveying applications. For more information, visit acsvalves.com. MEET MINI, MARION'S R&D-SIZED MICROWAVE VACUUM DYNAMO. Take time out of transforming ideas into solutions. Innovate and iterate faster than ever before. That's the power of Mini. Sample applications include; powder drying, microbial reduction, low-temperature drying, change of state, extraction, dehydration, solvent removal and many more. It's like adding rocket fuel to your test lab. Shorter processing times. Instant power control. Eliminate burning and case hardening. No warm-up or cool-down needed. You know…. Superhero stuf. Learn more about our process solutions and the competitive advantage we can create for you at MarionSolutions.com. marionsolutions.com SUPERHERO REDEFINED. INNOVATION REDISCOVERED.